A few weeks ago we flew out to Spain for a romantic getaway at the luxury DDG Retreat in Casares. 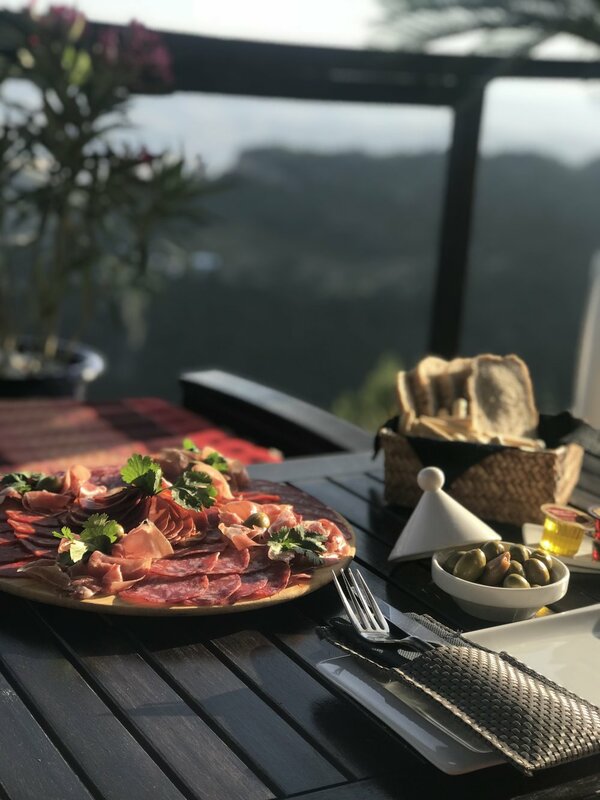 An hour away from Malaga, set in the heart of the Casares mountains, DDG retreat was nestled away in glorious woodland. We arrived and the retreat certainly exceeded our expectations. The views from the entrance alone that overlooked Gibraltar and the African Coast were incredible. Family run, we were greeted by Olga and Daria, who were lovely and own the sanctuary. We were given a glass of freshly squeezed orange juice, followed by a tour of the premises. The Maharaja Suite was the first suite that we were able to see. Inspired by the DDG family's trips to India, the suite featured wooden decking, a plunge pool, an outdoor bamboo bathtub, themes of red and purple and Indian patterns throughout. Inside there were ancient Indian artefacts, Buddha ornaments, rugs, a lot of gold and candles. Relaxing music from the country really set the suites’ Indian vibe. Next on the tour was Casa Pino – a Moroccan style villa, that had a historical feel. Features included; exposed brickwork, orange tones, a huge black chandelier and black wooden beams. There was a lot of attention to detail in the villa- antique iron pans, pots, trinkets and teapots. Modern features were merged in too- air con, TV and a walk-in shower. Outside, Casa Pino had its’ own private patio with views of the mountains, a plunge pool, sun loungers and an outdoor bath. We were then taken to our beautiful suite, Casa Royal, the luxury tent style cabin had a stunning terrace, which included a hot tub overlooking the mountains, with views of the Spanish coast. Inside we were greeted with a complimentary bottle of Cava on ice and spa music playing. The luxury suite itself had a home cinema, stylish furnishings, chandeliers and air conditioning. We spent our time relaxing in the sunshine on our private deck and in the beautiful infinity pool, which overlooked the mountains. In the evening Olga served us a beautiful platter of meats, olives and bread- light and filling. It truly felt special with our glass of Cava overlooking the Spanish scenery. We used our time at the retreat to have a digital detox, for the first time in months we really felt present. As the sun set, we chilled in our hot tub, sipping our Cava and enjoying the peacefulness. There is nothing quite like the calming silence with only the sounds of the vultures flying above. As it got a little later we even heard a wild boar grazing in the bushes next to us! The next morning, we enjoyed breakfast at the dining area by the main house. Hand squeezed orange juice and freshly brewed coffee were laid out on the table. The breakfast menu had many different choices, we opted for the French toast, bacon omelette, boiled eggs, porridge and fruit which had all been freshly prepared. We spent the day using the gym, playing tennis, swimming and relaxing on our sun loungers. DDG also has a spa facility for those wishing to experience a massage or treatment. There were many books, CDs, DVDs to borrow and Casares was within walking distance of the retreat. We had a fabulous stay at DDG. Olga, Daria and the family couldn’t have been more welcoming. If you are looking for a few days break from the hustle and bustle of city life, or just some time away with your loved one, I can truly recommend DDG. The service is fantastic, the retreat and its’ amenities are luxurious and the family really have paid attention to detail throughout the premises.